If you are like me, you are big on the Cardinal t-shirts. Your closet looks like someone hit a vein over your clothes. 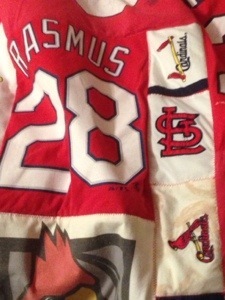 It’s not “should I wear a Cards shirt” but rather “which Cards shirt should I wear”. The shirts, jerseys and so on define your look, especially when the heat of summer is prevalent. What happens, though, when the name on the back is long gone or you no longer fit decently into shirts from times past? (Yes, both of those were an issue for me.) They take up closet and storage space, even though you know that you’ll likely never wear them again. Still, you don’t want to pitch them or use them as rags. What to do? 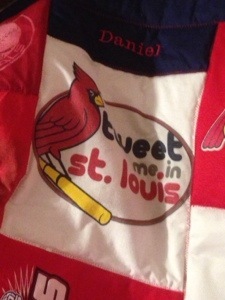 A good friend of mine is quite accomplished at all things crafty, especially things that involve sewing. 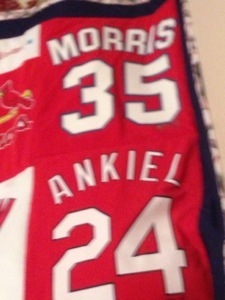 So I got the bright idea to ask her to make a quilt out of the old shirts I had in my collection. Not knowing what she was in for, Liz agreed. I got the finished product this evening and it’s a wonderful quilt. It’s memory-inspiring and a great way to start wandering down memory lane. 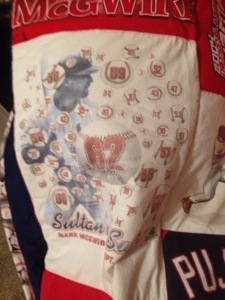 I remember ordering this shirt the day after #62, for instance. 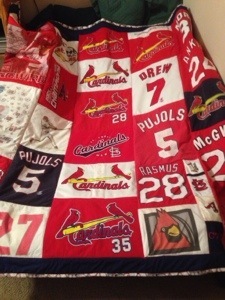 There are a number of Mark McGwire shirts as part of this quilt, not because of any statement but because I got a lot of shirts around that time, which were a number of pounds ago. This one came from the first Blogger Day at the ballpark back in 2011. The first time the UCB really gathered together. That makes it special in its own right. This turned into much more of a project (or ordeal!) than Liz expected, but I’m very glad she stuck with it. It’s a unique piece to add to my collection, plus it’ll get plenty of use this winter!